Actress Karisma Kapoor posted an old picture of Krishna Raj Kapoor as a tribute for her grandmother, who died on Monday morning in Mumbai. Krishna Raj Kapoor, wife of Raj Kapoor, died of a cardiac arrest. She was 87. In her Instagram post for Krishna Raj Kapoor, Karisma posted her photo with great grandchildren - Samiera, Kiaan and Taimur. "Remembering big dadi," she wrote, adding hashtags like 'memories' and 'family.' 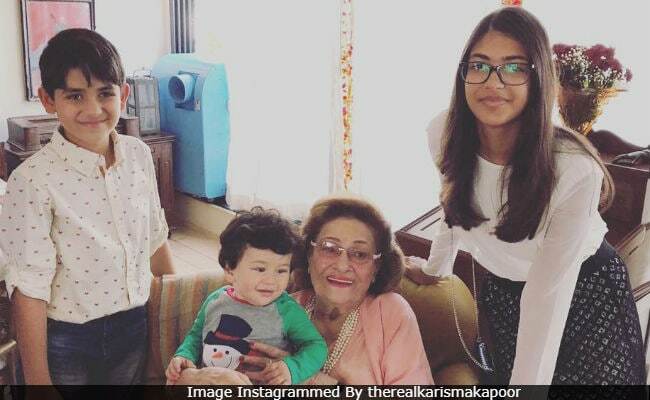 The photo is from last year's Kapoor brunch, hosted every Christmas at late actor Shashi Kapoor's Mumbai home. Samiera, 13, and Kiaan, 8, are Karisma's children while Taimur, 1, is Kareena's son with husband Saif Ali Khan. In the photo posted by Karisma, Taimur is cradled in Krishna Raj Kapoor's arms while Samiera and Kiaan stand on both the sides. Raj Kapoor married Krishna Raj Kapoor in 1946 and they had five children together - actors Randhir Kapoor, Rishi Kapoor and Rajiv Kapoor and daughters Rima Jain and Ritu Nanda. Grandchildren like Karisma, Kareena, Ranbir Kapoor, Armaan and Aadar Jain are also actors. Krishna Raj Kapoor's last rites were performed by eldest son Randhir Kapoor, who after her death told news agency PTI, "My mother passed away at about 5 am today due to cardiac arrest... old age was another factor. We are deeply saddened by her demise." Karisma and Kareena were there by the family's side when several members from the film industry came to pay their last respects to Krishna Raj Kapoor. Last night, Neetu Kapoor also paid her tribute to her mother-in-law Krishna Raj Kapoor on Instagram. Neetu Kapoor and son Ranbir are reportedly in the US, where Rishi Kapoor is currently undergoing medical treatment.